It is a YONEX shuttle with fewer types, but this and standards and new officials are immutable lineups. It has stable flight and durability which is also used in practice sessions hosted by associations of municipalities and towns and villages. Although it is "pitiful" to compare flight and durability with the new official, you will be able to experience durability improvement and stability of flight just adding hundreds of yen per standard to the standard. Since it is not a feeling that the feathers will "get rushed" in a way of being broken, it is possible to knock down and defeat the game by ⇒ basic striking ⇒ knocking. I think that there are no other options when you have to keep in touch with your wallet in case you are lost in a career circle management. I would like to practice with the same shuttle as the game, but I think that there are also some people who are difficult in terms of cost. 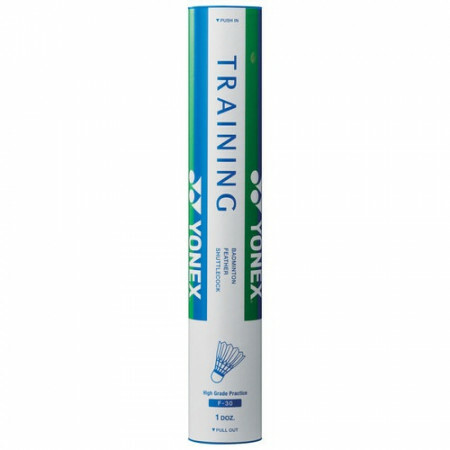 For those of you, we recommend training Yonex. It is an inferior match against the game ball and it is hard to break. Pricing is also cheaper than the game ball so it is perfect for practice. Europe	It is hard to break down, it lasts long. I use Yonex in various ways. I bought a little expensive training for myself and tried it. It was good in the cold winter. Heavy duty worry about wearing off has decreased. Because the price is slightly high, it may be a waste for club activities. Excellent durability, relatively wallet-friendly is the most characteristic. That does not mean that flight is not bad, I think that it meets the minimum requirement. I do not like the hit feeling very much, but I think you are looking for it with this amount of money. Viennetta	Balanced TRAINING! ! ! I am playing badminton at the university. Prior to the convention, we practice at TRAINING. YONEX Manufacturers offer a wide variety of shuttles, some people may not know what shuttle to use, but TRAINING is recommended. I think that the durability of the shuttle is high for reasonable price. It is TRAINING that you can use well for practice and for games as well as balance. Although shot feeling and quality are somewhat inferior to the shuttle such as NEWOFFICIAL, price and durability are satisfactory. Chaplain	A solid flight is attractive. The charm is flight performance and durability. Especially the jumping flies firmly and feels good. It is also a factor that air resistance is low. It's a bit heavy, so it's probably best for practice. Although there are individual differences, it is attractive that durability is sufficient. Akky	Even hard exercises are hard to break. Sometimes the feathers are made quite durable, so hard practice does not break easily so easily. Therefore, it is a shuttle which is used especially in the department activity etc. which repeats daily hard training. The reasonably priced as well as monetary value is also one of the most appreciated factors.